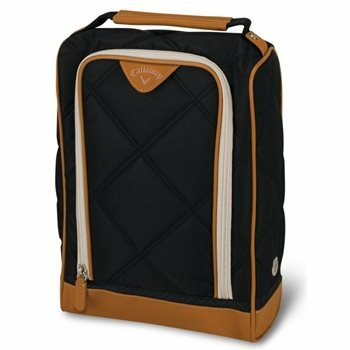 Carry your shoes in the Callaway Uptown shoe bag. The bag is constructed with durable nylon material, a durable leather carry handle, and a durable polyurethane base. The easy-glide zippers allow quick access to your shoes and the ventilation inserts along the sides provide adequate air flow to help keep the bag smelling fresh.